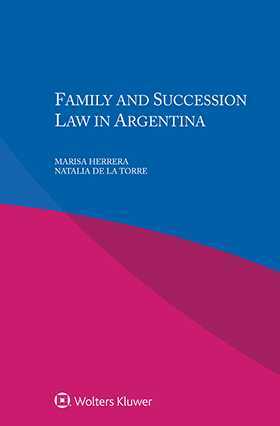 Derived from the renowned multi-volume International Encyclopaedia of Laws, this concise exposition and analysis of the essential elements of law with regard to family relations, marital property, and succession to estates in Argentina covers the legal rules and customs pertaining to the intertwined civic status of persons, the family, and property. The book is primarily designed to assist lawyers who find themselves having to apply rules of international private law or otherwise handling cases connected with Argentina. It will also be of great value to students and practitioners as a quick guide and easy-to-use practical resource in the field, and especially to academicians and researchers engaged in comparative studies by providing the necessary, basic material of family and succession law. Chapter 4. The New Civil Code, Regulation of Domestic Partnerships in Title III, Book Two. Chapter 2. Requirements and Conditions for the Validity of a Marriage. Part IV. Marital Property System. Chapter 2. The Principle of Freedom in the Property System: The New Civil Code. Chapter 3. Classifying Property: Community Property. Chapter 4. Proof of Classification of Property. Chapter 5. Property Acquired While Separated. Chapter 6. Permitted and Prohibited Contracts between Spouses. Chapter 7. Administration of Property during the Marriage. Chapter 8. Burdens and Debts. Chapter 9. Dissolution of Community and Post-communal Indivision. Chapter 10. Liquidation of the Community. Chapter 2. Grounds for Divorce. Chapter 5. New Civil Code. Chapter 3. Financial Support between Grandparents and Grandchildren. Chapter 4. Right of Communication. Chapter 2. Determination of Filiation. Part VIII. Assisted Human Reproduction Technology. Chapter 2. Medical Coverage: Law No. 26,862. Chapter 4. New Civil and Commercial Code. Chapter 2. Who Can Be Adopted?. Chapter 3. Who Can Adopt?. Chapter 6. The Right to Know One’s Origin. Chapter 2. Entitlement and Exercise of Rights. Chapter 3. Personal Care and Visiting Regime. Chapter 4. Administration and Management of the Child’s Estate. Chapter 6. International Restitution of Children. Chapter 7. Termination, Disqualification, Suspension and Restoration of Parental Authority. Chapter 2. Law No. 24,417. Chapter 3. Gender Violence and Child Abuse. Chapter 4. Care Agencies for Domestic Violence Addressing and Providing Judicial Intervention. Chapter 3. Hereditas Legitima and Its Protection. Chapter 4. Testaments, Testamentary Provisions and Legacies.